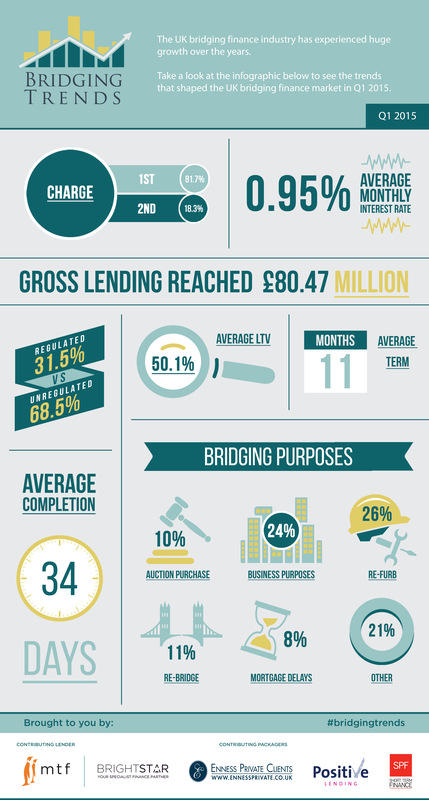 Take a look at the infographic below to see the trends that shaped the Bridging Finance Market in Q1 2015. In its first quarter, the data has already shed light on some interesting factors in the bridging finance market. A significant percentage of bridging loans are unregulated, suggesting they are largely being used in a commercial context. LTV levels remain sensible, notwithstanding some recent entrants offering high LTV loans. However, the most significant result involves duration. An 11 month average term signifies how the bridging loan market has changed over time from being a short term fix to a longer-term facility, providing extra breathing space to the rising number of borrowers struggling to secure mainstream funding. These results suggest ‘bridging finance’ is no longer a broadly appropriate phrase and poses the question, ‘is this the new breed of specialist lending’? First can I say how excited we are to be contributing to Bridging Trends, which unlike some other market commentary does not bog you down with pages of narrative and figures that should most definitely be taken with a pinch of salt. It takes a fresh, modern approach with a visual snap-shot of the bridging industry in a format that is easy to digest – even by those bridging novices out there. The split of 1st and 2nd charge business was as I would expect, as was the Regulated Vs Non-regulated business split. The real stand-out trends for me were the average LTV, which was surprisingly low (at 50%). The average monthly rate, which at 0.95% was higher than I expected and also the 11 month average term, which once and for all should put to bed the misconception that bridging loans are typically repaid in less than 6 months. Here at Brightstar we always encourage our brokers and borrowers, to take more time than they consider they need, just to safe-guard them against defaulting. With exit fees generally being a thing of the past, clients can always redeem early, but failing to repay by the end of the term can be extremely costly. This is where borrowers need to seek advice from bridging experts. Typically the first three months of the year can be unpredictable in terms of completions, but the overall loan to value was surprisingly low. The average rate on the other hand was surprisingly high in an environment where pricing is under downward pressure. This can be accredited to the more expensive highly specialist and niche short term financing requirements (like leasehold restaurants) which helped balance the overall figures.